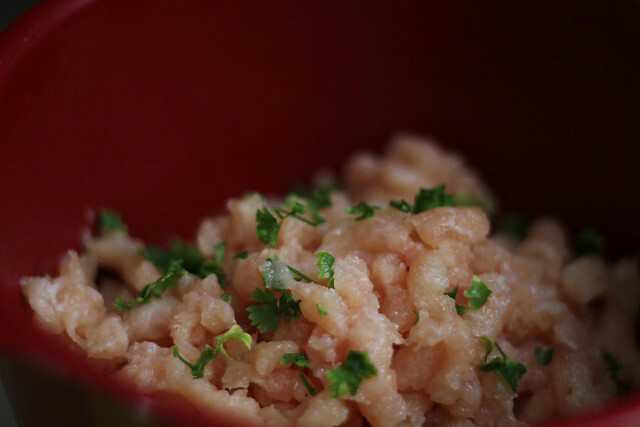 Another great Portuguese recipe to add to your stash. 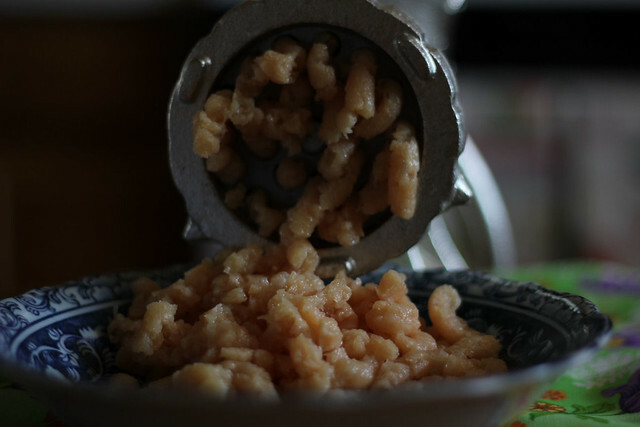 You can certainly use ground chicken bought at the store, but I always grind mine up using my Meat Grinder, and I love not only the texture, but the taste, the look etc. It is a worthy investment and you can find a Meat Grinder for around $30. The best way to grind any kind of meat, is to have it either still frozen or semi frozen. I always grind mind straight from the freezer. 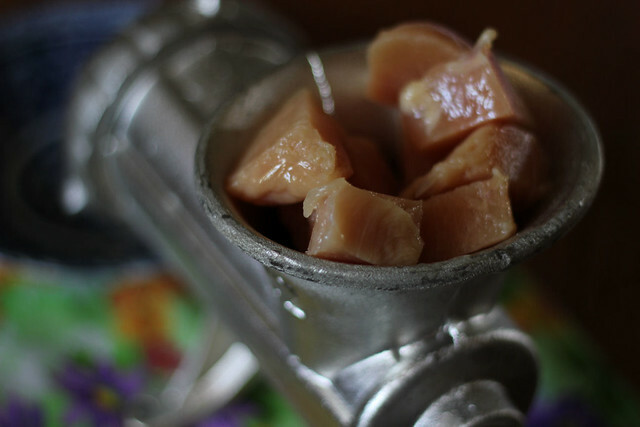 Cut the chicken breasts into small cubes and grind. except the bread. 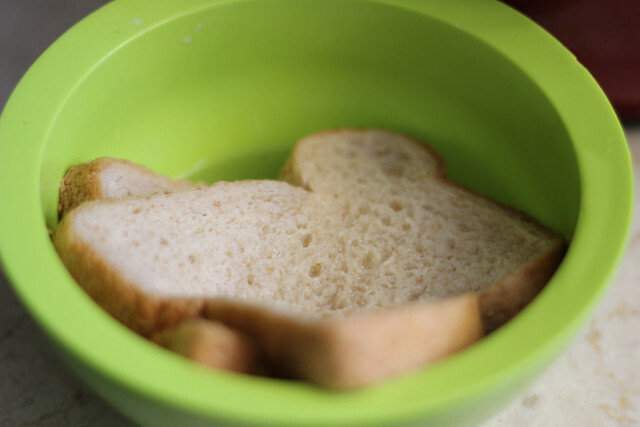 In a separate bowl, place the bread slices, add a little bit of water and dip the bread until soggy. Squeeze out the water, not all of it, leave a little. 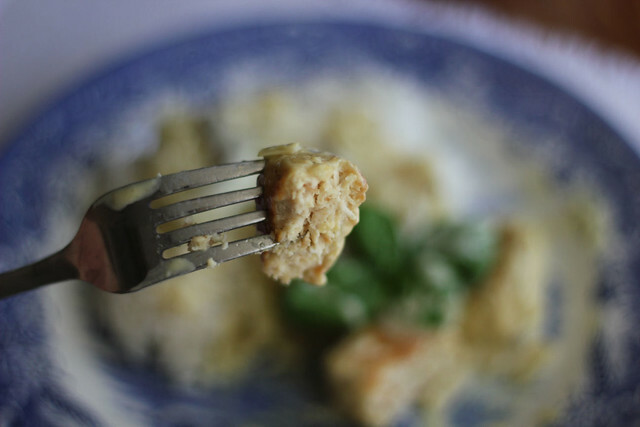 Break into small pieces and add to the chicken mixture. 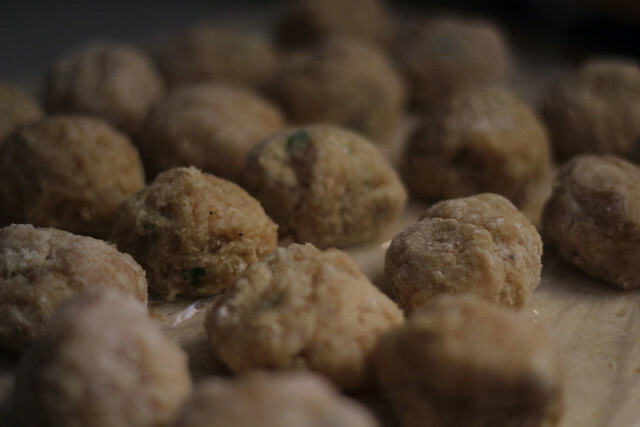 Mix everything well, add the flour and the egg, mix well and shape into meatballs. 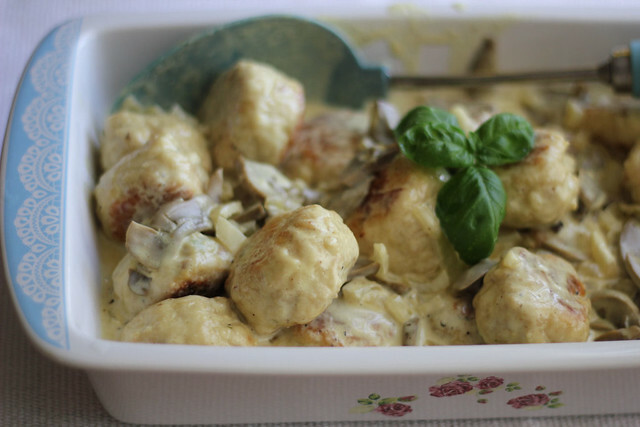 Use flour to sprinkle on your hands and the chicken mixture so the meatballs don't stick. 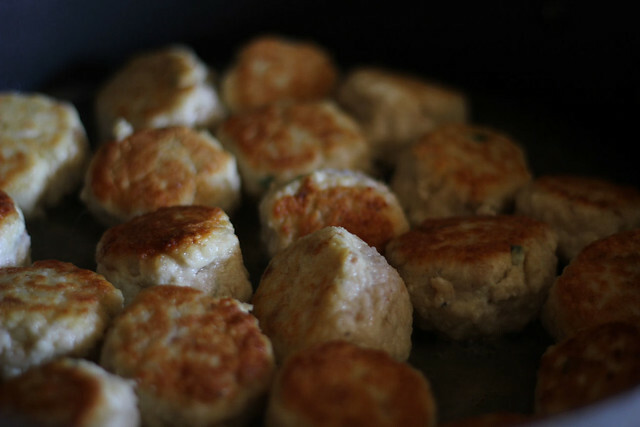 In a skillet, add a little butter, and fry the chicken meatballs until done and nicely browned, remove to a plate. Add the onion and cook for a few minutes until tender. 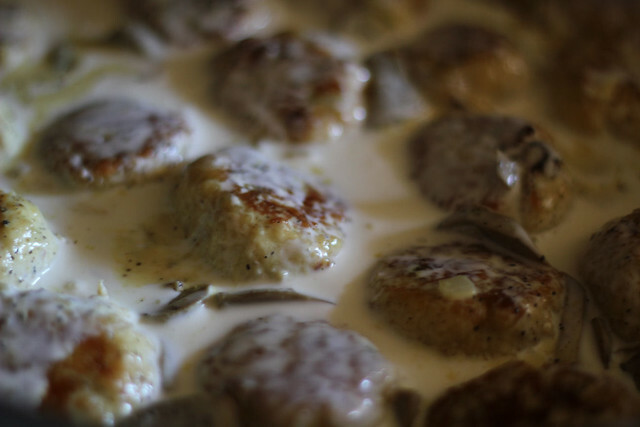 Add in the mushrooms and the heavy cream and simmer for a minute or so. 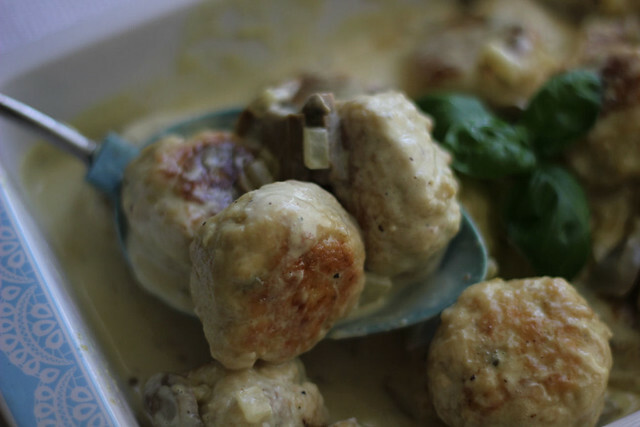 Place the meatballs back into the skillet and heat for a few. These are so good, and they taste even better the following day. I like using mine in a sandwich. It looks so fresh and tasty. My grandmother had a meat grinder like that, and I have been thinking about one to grind my own beef. Can you put the meat grinder in the dishwasher to clean it? Yummy! 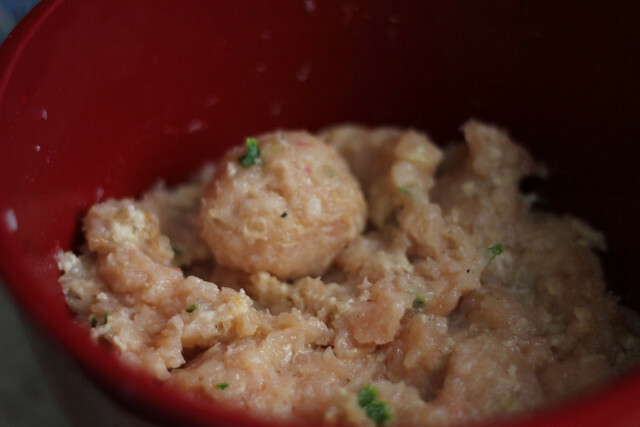 I've got a crockpot recipe for meatballs I've been doing. I've used mostly chicken, and turkey once, I actually like the chicken better. It has a red sauce on it, but your cream sauce looks incredible :) I hope to one day be ambitious enough to grind my own meat, but I'm not there yet! Seeing you do it inspires me though, Sandra, thanks for sharing! 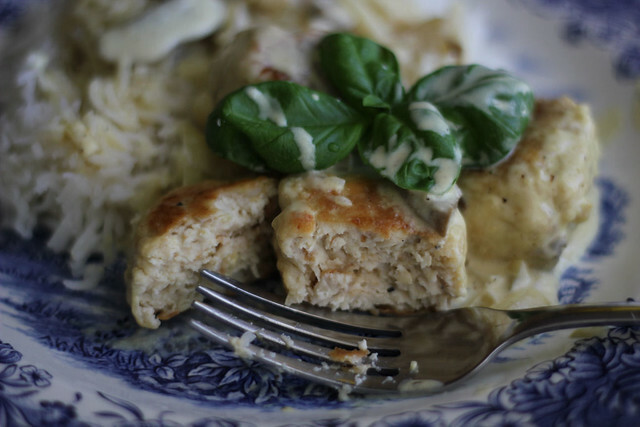 :) I'm getting ready to blog a similar recipe! Looks great Sandra!